The annual Veterans Day is a long time tradition for the community of Denison. Also becoming part of the tradition is the Knights of Columbus Color Corps that leads the parade down Main street in Denison. They have been the official Color Guard for the last three years and also participate in the Christmas parades in Denison and Sherman. 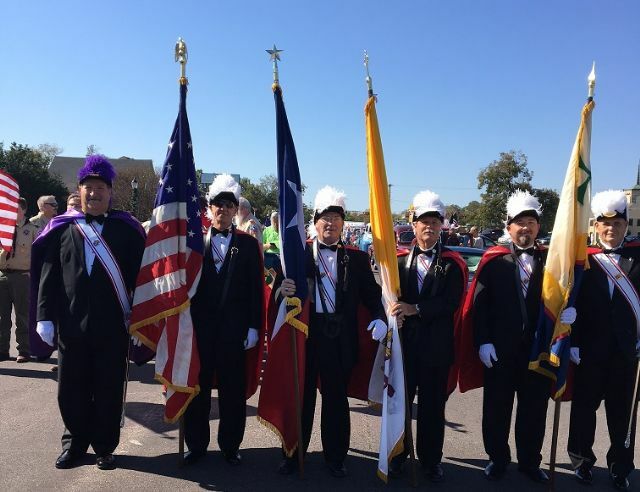 The Color Corps is from Assembly 1601 which includes members from St. Patrick (Denison), St. Mary (Sherman), Holy Family (Van Alstyne) and St. Michael the Archangel (Denison). The parade coordinator for the parade is FNSK Gary Cox, a retired USAF Colonel. Thank you Color Corps for all you do to demonstrate our faith and patriotism.